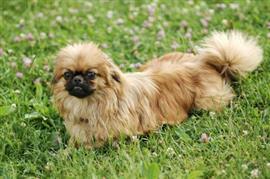 The Pekingese is also known as the Pekingese Lion-Dog, a name taken from an early Chinese history. There are several different legends of the breed's origin involving a lion falling in love with a much smaller creature and coming to Buddha for help. Buddha helps by shrinking the lion to the size of its lover, and the Pekingese is the offspring of that relationship. Many great names can be taken from the legend and the Pekingese origins. Names of famous lions (especially cubs) from movies, books, and television make excellent choices. Simba (from 'The Lion King') and Elsa (from 'Born Free') are a couple of examples of famous lion cubs. Many people like to give their Pekingese a Chinese name that has a good meaning and attractive ring to it. Bai (meaning white), Meili (meaning beautiful), and Zhen (meaning true) are few options. Outside of the origin based names, size is the most commonly used naming platform. The list includes many cute names that are typical among smaller breeds. Some of our pages will contain a subcategory. A subcategory is a slightly more specific grouping than the main topic of the page. For a subcategory, we will include a separated table of names and corresponding descriptions. An example of a subcategory of Red Dog Names would be 'Dog Names Inspired by Red Wines'. If you have any subcategory ideas for the Pekingese Names page, we would love to hear them. Use the form below to submit your ideas.